Acclaimed author (and Black woman oracle) Toni Morrison once said that Black women are the original girlfriends. “Black women have always been friends. I mean, if you didn’t have each other you had nothing,” Morrison said in a conversation with Maya Angelou and Nikki Giovanni for Essence. 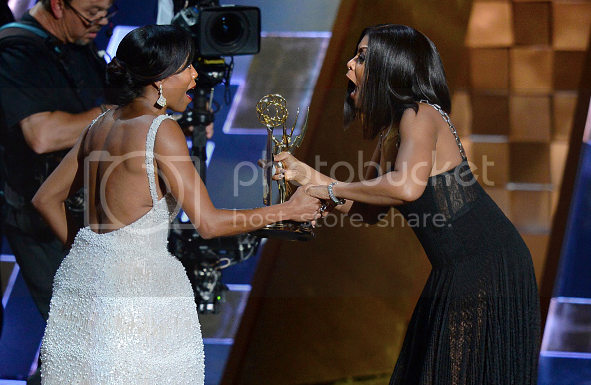 Actress Taraji P. Henson proved this to be true at the Emmys on Sunday night when she expressed genuine enthusiasm for Regina King winning for Outstanding Supporting Actress in a Limited Series or Movie for her role in American Crime and Viola Davis’s win for Outstanding Lead Actress in a Drama Series for her role in How to Get Away With Murder. Davis and Henson were nominated in that same category. However, as Davis walked down the aisle to receive her award, Henson jumped from her seat and gave Davis an enormous embrace and whispered words (one can assume of positivity) in her ear. Henson once sang, “You know it’s hard out here for a pimp.” But the reality is that it’s hard out here for Black actresses in Hollywood. Many Black actresses have publicly shared the agony of having to go up against each other (their friends) for the same few (and oftentimes lacking in substance) roles. It could be easy to become jealous and envious of those who are constantly landing roles (and getting paid). This is especially true in an era of reality television where Black women are often shown to be catty, mean, and outright hateful toward one another. However, Henson’s display of support for her sisters was a way to help steer the ship back on course. Black women expressed delight all over social media as we watched Black women celebrate one another – out loud and in public. I loved the moment when Regina King was at the microphone ready to accept her award and Henson let out a single, “yasssss” accompanied by applause. That yassss loosely translated was: I love you, girl! You rock! You did this! This is your moment and I’m going to let everyone know to celebrate you! As women, we need at least one “down to ride, I got your back” homegirl – who we can call when we get that promotion, that raise, that engagement ring, that condo, or that goal we’ve been working on for forever. Be that homegirl to someone in need and get one in your life if you don’t have one. Between street harassment, police brutality, domestic violence, and sexual assault incidences – it seems that Black women aren’t safe anywhere. This is why it’s imperative that we offer ourselves as safe spaces to one another. When we serve as ports in the storm, we let our sisters know that we are home base. A place of belonging. And as Black women we can come to one another and know that we are welcomed. Loved. Heard. And hugged. Where we can be rocked. And resuscitated. Allowed to blossom. And flourish. And fall. And try again. A safe space where we are not mocked. But celebrated instead. Henson proved that you can shine a light on your sister’s success, without dimming your own light. Henson didn’t lose any of her celebrity wattage, current jobs, future offers, money, or pride, by cheering for King and Davis. In fact, people are talking about Henson’s support almost at the same rate as Davis and King’s wins. Henson knows the worth of her own light. She demonstrated what it means to be a true star – shining bright in the sky among the other stars – without feeling insecure about the light next to her. After Davis’s win, Henson said, “I would’ve felt weird if I would’ve gotten it over her. You know what I mean? She’s been doing it longer. Like, you just gotta give respect and know when your time is.” This means that Henson believes that she is deserving to win and that she will be rewarded one day. Just because Davis won this time, doesn’t meant that Henson won’t ever win. It will just be when it’s her time. Maybe the win won’t look exactly the same, but you have to know that you will win in your own way, in your own time. When you stand firm in that, then you can be sincerely excited and supportive about another Black woman’s win. Henson’s glee for her fellow sisters demonstrated the importance of Black women continuing to be each other’s support system, cheerleaders, and girlfriends. Morrison was right, if Black women don’t have each other we have nothing. And if we don’t support each other’s wins then who will? Diana Veiga is a Spelman woman, a DC resident, and a freelance writer. Of course, she’s also on Twitter.